Personality: Mazus Grim is abrasive and hostile, he could care less about anyone that's outside the Dark Hand and shows aggression towards who tend to go against the cult. This doesn't bode the same for ex-members, who Grim claims to be lost sheep that will return to "hear the gospel" once more. To make matters worse, he's also superficial. This is kind of the reason why the dark hand likes to have a relation to everything in terms of gain or advantage. To set the organization aside from other cults, he values influence. In an odd way, he always remains mentally stable, even asking for realistic outcomes towards situations that he's obviously upset with. This is due to the fact that he truly believes that he is doing the right thing for humanity by bringing back the being, with every action being made of his own free will as well. But just because he's reasonable, it doesn't mean he's any less demanding. Grim is a methodical human being from the way he operates, or even converses with. 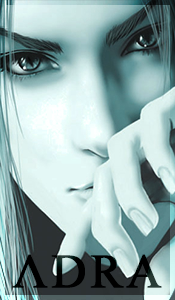 His depravity is linked to his grimoire, plagued to see the world ruined without the master's intervention. Appearance: Grim actually wears tattered black leather armor. This set of armor has a pointed helm with a face guard with the shape of a laughing face on one half and a crying face on the other. Attached to the forehead area is a crafted leather ornament piece shaped in a bird beak. The shoulders are squared, long and fairly small in size. They're decorated with two rows of bones on each side, one row is at the front and the other on the backside. Special Traits: The Magic tool Grimore. His wand is used as a bookmark for the book itself. History: Mazus Grim started in heliohapt as a slave. His beginnings were that of a poor person, but he was allowed to study magic in secret by the slaveowner's wife. He was also taught to read Alma Torran words for the sake of serving a greater purpose as he got older. Truthfully told, the slaveowner's wife was apart of a cult following that centered around the black pyramid. This cult was the dark hand. It's rumored abilities to return the dead back to life and invoking alma torran magic was the lure that most invidious made. 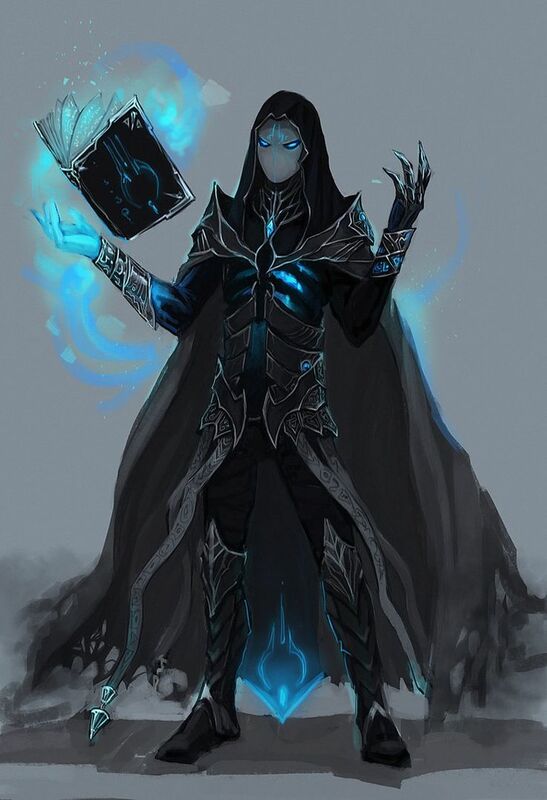 As soon as he turned twenty-one, fully trained in the arts of the arcane, Mazus Grim was given a book of some kind called "The Testament Of Doxrus". The book served as the access towards curse magic, as well as producing the whispers in his mind. 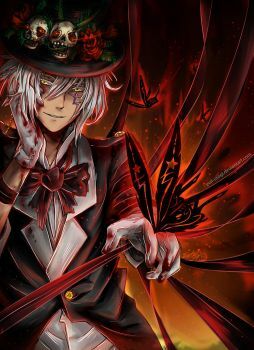 It deprived him fully, his love of magic became a lust of desires and servitude towards the will of a dangerous being. After the destruction of the black pyramid, Mazus Grim vowed to reclaim its former glory and resurrect the being that is said to be the leader of the Dark Hand. Due to the pyramid's destruction, as well as the vice/sin that Mazus grim has gained as the listener of the master, he became the leader that acts out his will. The "Master" that they are trying to bring back is Doxrus, the magic tool grimoire is linked to him. It's linked to Doxrus because it was created and sent out from the alma torran plane hes trapped in to reach out to individuals to convert them into worship and somehow cause them to free him. Personality: The thing about Demien that might have most on the fence is the fact that he's disloyal. He tends to float around to offer his assistance, but he's always waiting for the next big deal to occur. He's monstrous in battle, it also goes in hand with his opportunistic nature on doing whatever it takes to get ahead. To top it off, his vindictive nature is only matched by Grim's own aggression, which is why he continues to follow grim. Demien is quite sensitive about his past. Appearance: His fairly short sleeved, hide jacket covers him to well above his knees and is barely tied with string at the bottom left side. The sleeves of his jacket are incredibly wide and reach down to below his hands, they're decorated with a decorative band almost at the edges. The jacket has a wide, rectangular neckline which reveals part of the relatively simple shirt worn below it and is worn with a big cloth belt, which is held together by a big belt buckle. The cloth belt is purely a functional addition. Special Traits: Tatto marking over his right eye. History: Demien was apart of Reim, going through the Coliseum as a bloodthirsty gladiator that also used strange black butterflies to fight. These butterflies are actually hive class of beasts called the Papilio, whose multicolor patterns are known to cause illusions. After losing to Decimus the immortal, he excused himself to be a soldier of fortune that sought combat. In all combat situations, he dreamed of painting the battlefield in red as a form of art. His art has reached the ears of Grim, who was impressed with him and became joined to him. Demien's job is to be around conflict and cause/assist the extreme suffering to both sides if possible. Because these NPCs will be partially DMed by staff when necessary, I'd like for you to explain how Mazus Grim remains mentally sane in an odd way. Just for general curiosity, is the cult you mention the Dark Hand? Did the husband have a part in this cult? If the cult was the Dark Hand and he somehow was allowed to be part of it, how did he become its leader? Please delete the part where is says "unlike most magicians." Heliohapt is made up of 90% of slaves, and just because magicians are rare, there's nothing saying they can't or aren't born into or start out as a slave. Magicians can only use wand or staff-like conduits for their magic, not books. I don't understand how a book can devour a wand and make the user hear voices. What exactly is the "Testament Of Doxrus" Please edit/elaborate this or delete it. Is Demien Villalobos a magician? Does he use some sort of magic tool? I only ask because I'd like to know how he uses "strange black butterflies to fight." How do these butterflies work? What makes them? How do they exist? - he became the leader because the black pyramid was broken down and killed the old ones. Also, survived the master's influence without going insane, leading him to be able to handle the grimoire. - the butterflies are hive beasts whose mysterious patterns cause illusions. Magicians can only use wand or staff-like conduits for their magic, not books. Please remove any mention that a book is used as a catalyst or conduit instead of a wand/staff-like object. When you say "additional invoker" do you mean as another conduit/catalyst? If so, it needs to be removed. 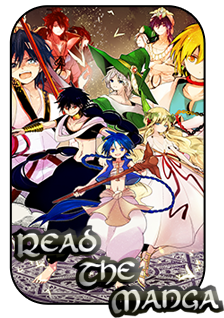 However, a suggestion would be a bookmark is used in place of a wand instead of the book. The book, obviously, would just hold the bookmark inside it. How is "the magic tool grimoire is linked to him", the Master? Something like this can only logically be done with Clairvoyance Magic, which uses the genetic material of whoever it is connected to. These illusions, are they like if you stare at a black and white swirl, you see it move when it really isn't or illusions like you see someone there or something there that isn't? made corrections, and the latter, the color patterns and from the way the butterflies are manipulated, they send signals to the brain that are interpreted into visual illusions. It's like hypnotism. Alright. All that's left is removing the special trait from Mazus Grim since that still says "A glowing and floating book that Grim uses in place of a wand." You could put that he uses a bookmark normally placed inside the book as a wand instead of the book itself. The book also wouldn't float, seeing as how he'd be using his own magoi to make it float and would probably be a waste of magoi. Everything looks good right now. Thanks for your patience. Personality: Due to the imposter studying the habits of Queb in order to keep up with the lie in the name of the Dark Hand, for the rest of his life if he needs to. There is a lot about Queb's original personality, but the fact he's selfish and arrogant is just the tip of the iceberg. Never mind the fact he's also neglectful, angry and provocative, but fortunately, they're balanced out slightly by being ambitious as well. But focus on his as this is what he's almost feared. Multiple nights have ended in disaster because of this and his irresponsibility, which is far from desired, but so be it. Fair is fair though, Queb does give some redeeming qualities. He's orderly and loyal when around good friends, that's at least some form of redemption. Unfortunately, his arrogant nature is always there and ready to strike at the worst moments. Special Traits: Is a member of the dark hand, an expert imposter under the command of Lagi to resume and continue this man's life, while serving the wishes of the group. History: As a high-class merchant of Heliohapt, one of Queb's main ventures was the import-export sect around heliohapt's docks. Unlike most merchants, Queb was wealthy enough to obtain his own cargo ship, which he used to cut transfer times from his whares getting from place A to place B. Being a former shipwright, a lot of the contents are made from his own blueprints, which is also what led him to fame by creating efficient seaworthy boats. Queb is also in the smuggling business by getting black market items on his cargo ship and selling them in heliohapt. 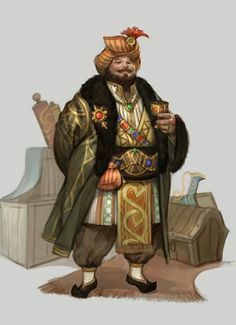 One of the reasons why he was a valuable asset to other merchants was that he gave a pass for them to board their wares on his cargo ship for an affordable percentage fee and budding relationship with them. He was celebrating his recent huang gaining success before being killed and replaced by Lagi's men, now producing results for the Garden of Eden by supporting the black market and import-export of Lagi's products. Personality: Due to the imposter studying the habits of Sanara in order to keep up with the lie in the name of the Dark Hand, for the rest of her life if she needs to. From how she's remembered, Sanara was imprudent and morbid, the dark side of things in life was often brought up and brushed off just as easily as a sick joke. She's also cruel, arrogant and power-hungry, but in an odd way, they're balanced by habits of being charismatic as well. Special Traits: Is a member of the dark hand, an expert imposter. History: In some odd way, she cares for whatever she puts her name on, which brings up the loyalty and pride in her work. Not only was she a slave owner, but by hosting these events, Sanara managed to rub shoulders and garner information that built her own personal wealth. After being killed and replaced by Lagi, this imposter was put in a higher position of power by running the brothels under requiem jynx's district. El Ragu and other forms of ecstasy are sold heavily there, as well as serving as a multitude of ways to gather information from unsuspecting and impaired guests. Plant- The False Ones: The thing about the dark hand that makes them so formidable is the way that they issue their influence. Important figures or notable individuals of any kind are killed and replaced by the Dark hand members as professional impersonators. Lagi has command over these operations in the sense of figuring out who gets replaced. With that, he picks a nice candidate from the dark hand after studying the target. There is no limit to how many people that Lagi can replace if they have no connections to anyone important, but a higher profile (business owners/Military/ Nobility) starts at a maximum of two per region. The npcs have to be registered after a series of missions that involves studying the target for information and finding a suitable replacement for them. Royalty/Rulers and their immediate inner circle requires an epic quest or a modded thread. Approving these retroactively, but for future NPCs, please consult staff about their role and how you plan to obtain them so we can work out an appropriate difficulty mission/s.